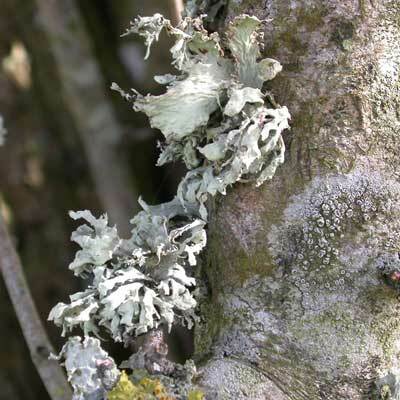 This grey to green, shrubby-tufted, often ragged lichen epiphyte is occasional on basic-barked trees in well-lit, often isolated situations: parklands, estates, waysides and should be first compared with R. canariensis. The two species are often confused, but in R. lacera the wide, reticulated branches (>1cm across) are relatively solid and not hollow or inflated. Powdery soredia are revealed through ulcer-like cracks on the surface. Discs are unknown in Irish material. It can be more abundant in exposed, coastal areas. Cracks along the edge and on the surface develop into ulcers from which spills powdery soredia. Simms, M. J., (2016). Ramalina lacera (With.) J.R.Laundon. [In] LichenIreland.